The immense success of the BBC’s latest series of Sherlock has got everyone, once again, talking about his skills of deduction, memory, and problem solving. Of course, you do not need to be a consulting detective to take advantage of these skills and “Sherlocking” your brain will give you advantages in whatever field you are in. It can improve you memory and recall (great when you forget the shopping list), increase your problem solving skills, and your ability to create rapport with people. It will also have the knock on effect of making you feel more confident in your abilities. Just don’t start acting like a “high functioning sociopath”; people can tend to model the wrong things, they will attempt to mimic the surface level behaviours, the aloofness and rudeness of Holmes. Don’t do that. It is never a good look and will make you appear as an unlikeable idiot. The number one skill of Sherlock Holmes is simply paying attention: You can learn a lot just by paying attention to thinks people don’t tend to notice. We so often spend most of our time inside our own heads, talking to ourselves, thinking back to what we did at the weekend or trying to decide what to have for tea. We are rarely present and paying attention to the current moment. This isn’t surprising, our whole system of perception is based on “best guess” and is inherently lazy, once we are subjected to the same stimulus a number of times we will simply stop paying attention to it (a process known as “habituation”) and since most of us live a routined life, we can start to sleepwalk through it if we are not careful. So the first thing we need to do is to deliberately and actively start paying attention to what is going on around us. One of the very best ways I have found to help practice paying attention is a process known as “Commentary Walking” (or commentary driving, commentary sitting on the bus, etc). If you have done any advanced driving skills, or been in the police or special forces, you will probably be familiar with this technique. It is exactly what is says! You just run a commentary in your head (don’t do it out loud, you may get some funny looks) of what is going on around you and inside you. Stick to sensory specific information, try not to analyse it (which is actually harder said than done as you will see). I suggest, to begin with you make three statements about what you can see, three about what you can hear, three about what you can feel and three about what you can smell and taste, then go back to what you can see. Keep this up for as long as you can. I suggest building up slowly – even if you make the conscious effort to do it for 5 minutes a day (maybe on your commute to work, or walking the dog) you will soon notice, in a few weeks, how much more observant you have become and how will start seeing things yo never noticed before. Once you have the hang of that you can start building up 30 second profiles on people. It is a great ‘“people watching” pass time when you have a spare few minutes. It is surprising how much information you can glean from someone just by studying them in detail for as little as 30 seconds. Many good communicators already do this (consciously or unconsciously) and adjust their communication style accordingly (matching and mirroring). You take two interrelated statements, or premises, and deduce a conclusion from them. Holmes is famous for noticing certain details that, by themselves, may be meaningless, but when combined create a compelling and often accurate conclusion. So you can start building on your observational skills and “30 second profile” and start deducing things from what you notice. To begin with you will probably be wildly wrong most of the time, but as you build up your experiences and references you will be surprised at how accurate you will be more often than not. You will start “piecing things together” and notice where information is missing, or people are taking wild leaps from insufficient information and you will starting asking better questions (a good working knowledge of the NLP Meta Model and Sleight of Mouth Patterns can help). We tend to get stuck in habitual patterns of thinking; the thought processes we day after day after day. It means we tend to use the same references, pay attention to the same things and make the same inferences and conclusions. To become effective at deduction you need to expand your thinking skills, work on your problem solving and lateral thinking. Try solving riddles and cryptic crossword puzzles (many of which can be found online), to start improving your lateral thinking skills. To begin with, if you are like me, you will find it all frustrating gibberish, but stick with it and you will suddenly get a “head click” moment where it will all start to make sense. I started by reading the clues from the the cryptic crossword and then the answer to start to understand how it worked. You need organise all the new information you are collecting (like the differences between brands of cigar ash) in a useable and easily accessible way. This is where your memory palace comes in. Probably the most talk about skill of the modern day Sherlock (at least in the last series) is his “Memory Palace”, I am not going to go into detail here as I have already written a detailed blog about it back in 2010. You can read it here. 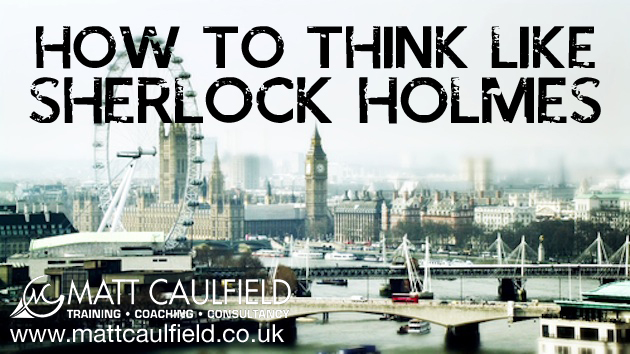 You will learn about how to think like Sherlock by actually reading the Sherlock books! An excellent book chocked full of examples from the stories. One of my favourites (if a little repetitive and long winded at times – but I would prefer it to be thorough! ).